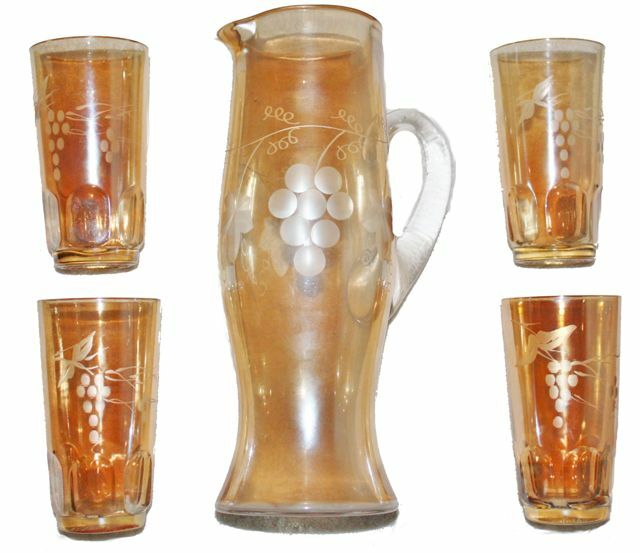 ENGRAVED GRAPE Tankard--ETCHED GRAPE Tumblers. ENGRAVED GRAPE Tankard: This is part of the Fenton #3600 pattern. It stands 10 ½” tall and has no markings on the base, which is typical of Fenton items. Only known A.O. HOLLY bowl. Seeck Auction. 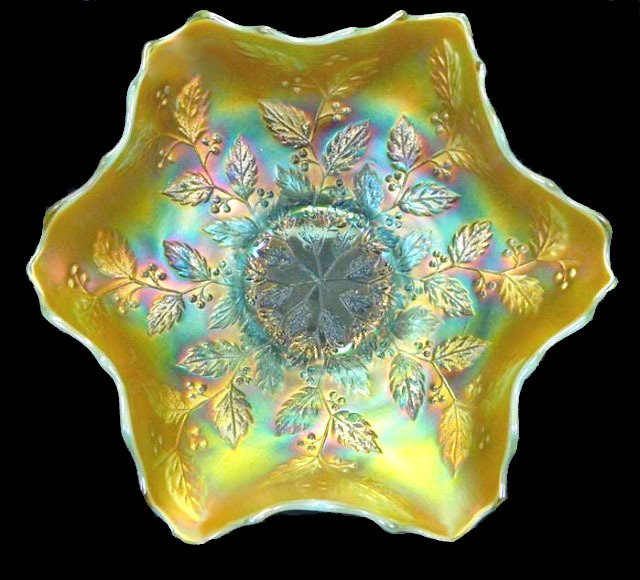 HOLLY Bowl: The base color came toward the end of the iridized glassware era. Popular as it was, and still is, one would be inclined to ask: “Why is this the only one known?” The Holly pattern was certainly an acceptable one in all other colors! Perhaps the sample bowl was given to a salesman who had not had much luck in selling that color, hoping the pattern alone would create interest? 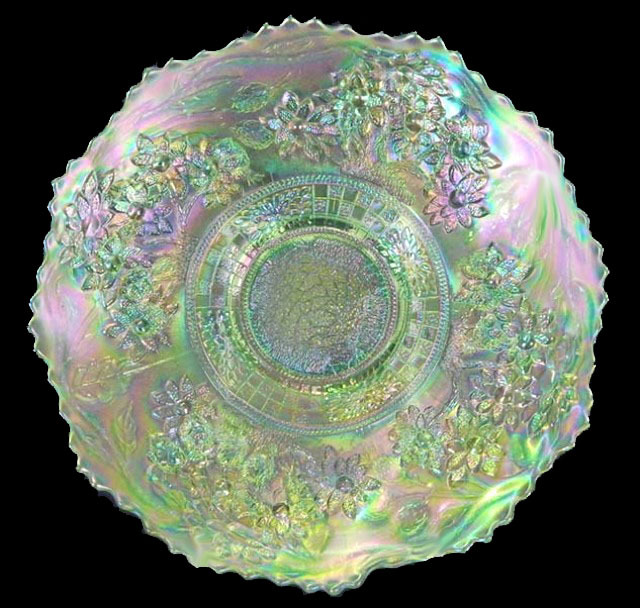 HOLLY Bowl: Whether ruffled, round, or ice cream shaped, Holly bowls in this color are quite rare! Considering the vast number of auctions, the opportunity to purchase one in this color combination does not occur often. IG ORANGE TREE with trunk - 9 inch - Seeck Auctions. ORANGE TREE Plate: The tree trunk addition to the basic pattern is always more desirable to collectors. Not more than 3 or 4 are known in ice green. One sold for $16,000 in the mid-nineties. Green BLACKBERRY BLOCK Tankard & Tumbler. Seeck Auctions. BLACKBERRY BLOCK: Blue is the “common color” in this pattern, with amethyst, marigold and green fairly scarce. There is a known white tumbler in the pattern. 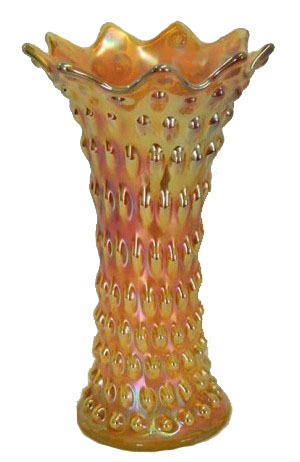 10 inch HOBNAIL VARIANT Vase - Marigold. HEAVY HOBNAIL vase: If you click into our pattern alphabet and from the H, locate Heavy Hobnail, you will be taken to Fenton Vases Part 4 and can have a look at a lovely green example. These are so scarce that auctioneers error in naming them. Our 10 ¼” amethyst example was purchased under the Rustic listing. These have a 4 ½”-4 ½” base and are known in amethyst, blue, green, marigold and white. 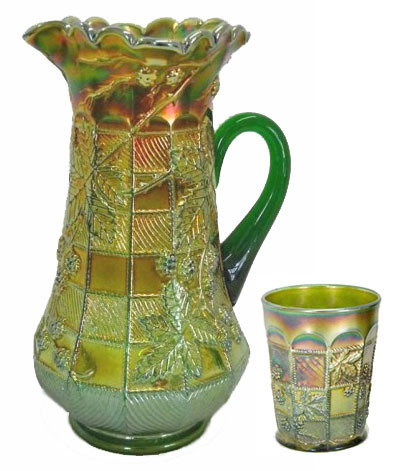 The marigold example shown here was listed by one of our leading carnival glass auctioneers as Rustic! For further details surrounding this rare vase, click into our HOBNAIL VARIANT segment and read the details presented by the late Frank M. Fenton, regarding this vase. ‘I am the Christ’, and will deceive many. And you will hear of wars and rumors of wars. See that you are not troubled; for all these things must come to pass, but the end is not yet.